The prosecution of one of the greatest sieges in ancient history offers a chance to assess the nature of Rome’s military discipline and its importance to the success of the imperial army. In a.d. 67, Levantine Ptolemais looked seaward to the calm of the Roman Mediterranean and inland to the storms of a rebel Galilee. The year before, the province of Judea had flown to arms against a monstrous Roman governor. The hapless legate of Syria had descended with a legion to suppress the revolt but had been driven back with loss, abandoning his siege engines. Now Nero’s new general, Vespasian, marched south from Antioch with two of the legions of Syria, and his son Titus marched north to meet him at Ptolemais with a legion from the garrison of Egypt. His army united, Vespasian marched inland into Galilee, the north of the Jewish realm, which was defended by a scratch force led by the Jewish notable Josephus. After the Romans captured him and he began to assist them, the flexible Josephus was eventually to chronicle the war, first in Aramaic, then in Greek. The Romans had fought many wars and countless battles since Caesar’s day — had captured Britain, completed the circuit of the Mediterranean, extended their power to the Danube, been thrown back from beyond the Rhine, and fenced with the kings of proud Parthia in the eastern wastes — but The Jewish War of Josephus is by far the most detailed written description of Roman fighting that survives from the first three centuries of the Roman Empire. To the Romans the beginning of war is not their introduction to arms….Instead, as if they had grown with weapons in their hands, they never have an armistice from training, never wait for crises to arrive. Their exercises lack none of the vigor of true war, but each soldier trains every day with his whole heart as if it were war indeed….He would not err who described their exercises as battles without blood, and their battles as bloody exercises. Of this same training, the fourth-century Vegetius gives details, looking back longingly to an earlier day: marching in regular step and quick time; marching with kit, with three long route marches a month; running, jumping, and swimming; throwing javelins; endless attacks with mock shield and sword on a wooden post, which stood in for a flesh-and-blood enemy; mass drill in keeping ranks and formation; and finally, mock battles. When the weather was fine, the Romans trained out-of-doors; when foul, under roofs. Even veterans, Vegetius tells us, were expected to exercise with their arms every day. The reality of such training is confirmed by the excavation of drill grounds and cavalry riding areas, of catapult ranges, by the traces of countless “practice” camps — sometimes many on the same plot of land — that Roman units built on maneuvers, and of elaborate practice siege works built around pre-Roman hill forts. In fact, disorder, fear, and exhaustion were the Romans’ constant companions in the Jewish war, as the detailed narrative of Josephus reveals. Roman training and discipline were certainly admirable in comparison to that of Josephus’ countrymen, as he pointedly told them, and especially valuable in a world where many opponents undertook cursory training or none. But training and discipline alone do not account for Roman success, and training and discipline themselves present a puzzle: How did they fit into the wider culture of the Roman imperial army? In a professional army, what was the relationship between Rome’s two ancestral military values: virtus, or courage, manifested as aggressiveness on the battlefield, and disciplina, or discipline, which the Romans conceived as a brake on overly aggressive behavior? Gabara was the first strong place in Galilee that Vespasian captured. Romans killed all the men and burned the city, and the villages and country towns round about. 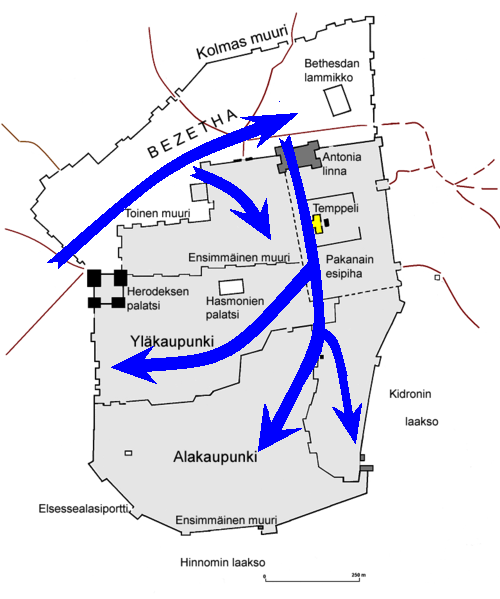 Next the Romans moved south to the well-protected town of Jotapata, as Josephus rushed to oversee its defense. The siege of Jotapata was bitter and lasted forty-seven days. Finally, the Romans built their earthworks up to the height of the walls. The Romans rushed the town before dawn, when they hoped the sentries would be drowsing. Vespasian’s son Titus and a military tribune were the first on the wall; others followed, and the city was captured before most of the inhabitants were awake. There was a general massacre. The dead were calculated at forty thousand. Josephus was captured. After a pause to rest his troops, Vespasian turned his attention to eastern Galilee. After some indecision the town of Tiberias surrendered and so preserved itself from destruction. Tarichaeae, by the Sea of Galilee, was the center of what resistance remained, and Vespasian moved toward it. A body of Jews attempted to resist the Romans in the field outside the city, and Vespasian sent Titus with cavalry against them. Titus led the charge in person and killed many by his own hand during the pursuit. It may be in this battle that, as Suetonius records, Titus had a horse killed under him and mounted another in its stead. The survivors fled into the town, and the dispute about whether Tarichaeae should surrender soon became an uproar audible even to the Romans outside. Taking advantage of the chaos, Titus led his cavalry into the shallows of the lake and so into the town, which was not walled on the lakeward side. Thus Tarichaeae was captured. Next came Gamala, on the other side of the lake and beyond. Soon the Roman rams had broken through the walls, and Roman columns were in the city, advancing without orders to the higher reaches of that steep place. But the Jews rallied and threw them back. The town was built on a precipitous incline: It was hard to retreat except onto the roofs of houses where they were flush with the slope, and these soon collapsed under the weight, killing many Romans in the resulting avalanche. In his anxiety at the crisis, Vespasian himself advanced heedlessly within the walls. Suddenly he found himself in the front lines and under attack. He formed those near him into a shield wall, stopped the Jewish onrush, and then retired slowly, front to the enemy, until he was outside the city. There could be no doubt that Vespasian and Titus were father and son: Both looked as if a giant had seized them by the ears and stretched their faces broad, leaving deep creases in their brows from the pulling. But father and son had far different perceptions of their roles in battle. Vespasian fought like Caesar, close enough to the front to command and encourage — at Jotapata he had even been hit in the foot with an arrow — but not to fight. Titus, by contrast, fought at the head of his troops and cut down enemies with his own sword. And the contrast was not merely because one was a cautious fifty-eight-year-old supreme commander and the other a carefree twenty-seven-year-old: Titus too had grave responsibilities, as commander of the Fifteenth Legion. After the setback at Gamala, Josephus depicts Vespasian giving a speech to correct and reassure his troops, carefully balancing the need for discipline with the need for courage. But if Vespasian gave such an address, his men paid it little heed. Soon after, three soldiers of the Fifteenth Legion crept by night to the base of one of the towers of Gamala and quietly dug out five great stones. They leaped back as the entire tower and the sentries atop it crashed to the ground. The Jews were in a panic. No less surprised were the Romans: No plans had been made to exploit the collapse and the chaos, and, remembering their previous failure, the Romans did not try to enter the city for a full day after. The digging appears to have been a private enterprise on the part of the three legionaries. When the Romans did enter the city again, Titus led them (he had been away during the first attack), and he once again cut down those he met. Even women and infants were slaughtered in this sack, in revenge for the earlier defeat; nine thousand were killed or threw themselves from the walls into the ravine that bordered the town. Only two women survived. After the capture of Gischala in the north, which surrendered to Titus after the warriors escaped by a ruse, all of Galilee was in Roman hands. It was now November and time to send the legions into winter quarters. In the new year, Vespasian’s strategy was to put down the revolt outside Jerusalem and drive all the surviving rebels into the seething city. While it was still winter he quickly seized the Jewish towns of the Peraea, to the east, across the Jordan River from Jerusalem. Those downstream learned of his coming when thousands of bodies floated down the river and washed up on the shores of the Dead Sea. In the spring Vespasian struck south into Idumaea, then north into Samaria. By June he had captured Jericho, completing his circuit of ravaging around Jerusalem. Vespasian was told that nothing sank in the nearby Dead Sea: He had prisoners cast in with their hands bound, and lo! They floated. Now all that remained was to march directly to Jerusalem and lay it under siege. But then fate put a halt to the campaign. Far away in Rome, Nero was overthrown and the year of the four emperors cast Italy into confusion. In the East, Vespasian waited upon events, and so the summer of a.d. 68 passed into winter. In June of the next year he moved to reassert his hold on Judea outside Jerusalem, wasting the countryside and taking some towns he had neglected before. He rode with his cavalry even up to the walls of Jerusalem and then rode away again. He avoided a major campaign in a.d. 69 because he had his eye on higher things: On July 1 the carefully instructed garrison of Egypt proclaimed Vespasian emperor, and his own legions and the powerful Syrian army soon followed suit. Away went Vespasian to manage a civil war against his rival emperor Vitellius, and by December Vespasian’s lieutenants in Europe had made him master of the Roman world. Rome’s new emperor sailed for the capital and left Titus to bring the war against the Jews to an end. Two years had now been squandered. Titus delayed no longer and ordered his legions, now reinforced to four by another from Syria, to advance on Jerusalem from both east and west. Approaching the city, he rode ahead with six hundred horse to reconnoiter, but, riding too close to the walls, he was cut off by a Jewish sally that broke the head of his cavalcade from the body. Titus could not go forward — garden walls and trenches blocked that path. The only way to safety was through the enemy, and through them he led his companions in a breathless, headlong charge, killing those who tried to block his onrush. Although unarmored, for this was no more than a reconnaissance expedition, Titus came through unscathed. Two of his companions were killed. Then the legions came up, and Titus ordered them to camp around the city. The Tenth Fretensis was assigned the Mount of Olives. While the Tenth was fortifying its camp, the enemy unexpectedly struck against it from the city. After a confused struggle the legion was turned to flight. It was rallied by Titus, who took the Jews in the flank with his personal guard. Having restored the situation, Titus established a protective line nearer the city and sent the Tenth back to build its camp. But the Jews thought the legionaries were fleeing and attacked again, and the forward Roman line collapsed before them, leaving Titus isolated with his companions on the slope. Now, and not for the last time in this war, Titus’ friends and staff begged him to take care: He was the general-in-chief, not a soldier. Everything depended on him, and he should not risk himself. This was also the standard advice of Greek tactical writers and the principle to which Julius Caesar had adhered. But Titus was having none of it. He held his position, himself fighting by hand. In their eagerness to chase those in flight, the Jews split around Titus’ small band like a torrent around a rock, and so Titus and his guard charged them in the flank. Once again the Tenth was in a panic — so much for Josephus’ “no disorder disperses them from their usual formation, no fear confounds them” — and it began to flee. Then legionaries noticed Titus in the fight on the slope below, and (Josephus says) pure shame at having abandoned their general rallied them. They pushed the Jews back down the slope. With the legions encamped, the Romans turned to clearing the ground before Jerusalem, shifting their camps closer to the walls, and bringing up the baggage. During this work, the defenders worked a ruse upon the besiegers. The Romans knew from defectors that the Jews inside the city were riven by religious and political faction and that some yearned to come to terms with Rome. So when a body of men appeared to have been ejected from the city amid a shower of stones and seemed to be trying to force their way back in while cowering from the Romans who looked on, and when those who had expelled them shouted “Peace” and offered to open the gates to the enemy, many Romans were deceived. Titus suspected a trick and ordered his troops not to move, but the guards of the Roman works made a rush for the gates without orders. Now those who had pretended to be expelled attacked them in the rear, and those who had promised to open the gates shot them down with missiles from the ramparts. Only slowly and with great loss did the Romans fight their way free. The defenders jeered and capered on the walls. Titus fumed and ranted — “among the Romans even victory without orders is a disgrace!” Josephus has him insist. He terrified the disobedient soldiers by threatening the horrible penalty for fighting without orders: death. But then Titus allowed the pleas of the legions to soften his anger, and no one was punished. Like Vespasian at Gamala, Titus contented himself with a lecture. At the climax of the siege, he would have reason to rejoice that he did not bloodily stamp out his soldiers’ initiative. Having selected what he hoped was a weak stretch of the fortifications, Titus ordered three siege ramps erected. With their throwing engines, towers, rams, and ramps, the Romans were fully up-to-date besiegers, but fully up to date in a technology of siege that had advanced hardly at all since Greeks had made a science of it in the Hellenistic period. An engineer employed by Demetrius Poliorcetes at his great siege of Rhodes (305-304 b.c.) would have been quite at home before Jerusalem with Titus, more than three and a half centuries later. The Jews attacked the builders with engines, missiles, and sallies, but to no avail. Then rams were brought up on the ramps. The defenders charged out against them but were thrown back, Titus leading the relief in person. Again the Jews sallied against the rams, and again Titus led his cavalry in, killing with his own hand. The Romans built towers to defend the rams. At night one of these, badly constructed, collapsed with an enormous crash. The Romans panicked, thinking the Jews were inside their camps, and confusion reigned until the truth became known. The Greeks had a saying they often applied to the blind and inexplicable panics that afflicted armies: “There are many empty things in war.” Despite Josephus’ editorializing, the Romans of the empire were no less vulnerable to empty panic than any other ancient army. With the towers brought up, the Romans swept the walls with missiles, so they could work the rams in safety. When a ram nicknamed “Victor” made a breach, the Jews abandoned the wall; behind it, two city walls remained. The Romans established a camp inside the wall they had taken, and during their preparations to attack the next wall, there was skirmishing in the open between the Romans and the defenders. During a combat at range with javelins, Longinus, a cavalryman, leaped out from the Roman lines and charged the mass of the enemy. He killed one, pulled his spear out, stabbed another in the side, and then made his way safely back to his comrades. Others subsequently emulated his deed. On one occasion a Jew challenged any Roman who dared. Pudens, another cavalryman, answered the challenge but tripped during the fight, and the Jewish challenger killed him, only to be shot down in the act of vaunting over the body by a Roman centurion with a bow. In Josephus’ account, reckless bravery was primarily the province of the Roman army’s auxiliary soldiers. Pudens was certainly an auxiliary; Longinus probably was also. During a Jewish sally, an exceptionally strong auxiliary cavalryman reached down from his saddle, grabbed a fleeing enemy by the ankle, and then bore his armored captive off just as he was to be admired by Titus. Such behavior is part of a wider trend: The Romans increasingly relied on auxiliaries to do their hand-to-hand fighting. This trend is most remarkably illustrated on Trajan’s Column, the enigmatic monument that depicts in astonishing detail on a huge spiral relief the Roman conquest of Dacia, in two wars of a.d. 101-102 and 105-106. So detailed and circumstantial is the sculpted narrative that it is nearly irresistible to suppose that it adapts to pictures a literary account of the war, perhaps that of Trajan himself. In the standard type of battle scene on the column, auxiliaries and bare-chested barbarian allies fight at the front, while at the back legionaries stand or build or lurk in fortifications, cosseting their ballistas. Pointing up the contrast between the roles of auxiliary and legionary is a scene high on the column in which auxiliaries attack Dacians on top of a wall, while a party of legionaries, right beside them, attacks the wall itself with picks; just up the spiral more legionaries hew and stack wood for use in the siege. On all of Trajan’s Column, legionary and nonlegionary infantry (auxiliary infantrymen, conical-helmeted Eastern archers, bare-chested barbarian allies) play very different roles. Put simply, legionaries parade, march, and work — and nonlegionaries fight. There are more than fifteen scenes in which legionaries build fortifications, sometimes with auxiliaries as sentries, or cut wood or clear forests or harvest grain or conduct supply wagons, fatigues that are depicted in seemingly demented detail over yard after yard of stone. However, legionaries are depicted fighting in only four scenes, while nonlegionary infantry fight in fourteen. Moreover, nonlegionary infantry engage in fatigues in only a handful of scenes, and when they do so the depiction is far less elaborate, and what noncombat work they do is more aggressive than the legionaries’: They slaughter prisoners and burn Dacian villages. The column strikingly conveys the wildness of Rome’s auxiliary soldiers. In several scenes auxiliaries, but never legionaries, are depicted as proudly presenting severed heads to the emperor, and one auxiliary who has taken a head but both of whose hands are occupied in fighting carries the severed head in his teeth, hanging by the hair. At the same time art and archaeology reveal changes in legionary equipment that suggest a more specialized role: armor with exaggerated protection for the shoulders, and helmets with exaggerated protection for the face and back of the neck, protection against downward blows. Roman legionary armor evolved under the early empire to protect the Roman soldier against attacks from above — exactly the type of attacks he might expect when toiling beneath the walls of Jerusalem; exactly the type of attacks he suffered when assailing Dacian forts. The Roman legions were used increasingly as combat engineers, and their armor evolved along with the function of its wearers. This increasing reliance on auxiliaries in battle reflects Roman patterns of recruitment. As the Roman Empire piled decade upon decade, the Roman army went farther and farther afield to find soldiers. Legionaries were supposed to be Roman citizens upon enlistment; auxiliaries were not required to be citizens. But to find both, recruiting officers struck out into the wild marches of the empire. By the end of the first century a.d., few legionaries were recruited in Italy, and even by the middle of that century the accents of legionaries from the northern borders sounded barbarous to soldiers stationed elsewhere. Such recruiting may have been driven by the reluctance of those in Rome’s more civilized dominions to serve or by their greater power to resist conscription, but it was certainly also driven by the sense that men from some of the empire’s less developed areas made excellent soldiers. The Greeks and the Romans were comfortable with the idea that some peoples were simply more warlike than others. Possessed of a vast empire, the Romans naturally recruited heavily from such warlike folk. Of the German tribes living on the Roman side of the Rhine, “the Batavians are outstanding in virtus,” Tacitus says, and so are “set aside for use in battle, like missiles and arms reserved for war.” Through the third century a.d., more than twenty-five Thracian auxiliary units are known, and in the fourth century the Thracians were still being recruited for their special warrior qualities. It was in areas where the most warlike recruits came from — Thrace, Britain, and Batavia — that the Romans pushed conscription to the point of inspiring revolts. The Roman army of the empire went out of its way to recruit virtus. And the army went out of its way to encourage virtus in its ranks as well. At Jerusalem Longinus the brave cavalryman had acted, Josephus says, in the hope of attracting the eye of Titus, expecting a reward if he did so. Hardly surprising; compared to the Republic, the Roman Empire had regularized and elaborated the spurs to rivalry in virtus among individual soldiers. The system of military decorations, which Polybius had pointed out as so powerful a motivating force in the Republic, was formalized and graded for rank. Decorations were mentioned in soldiers’ epitaphs, sometimes noting that they were given ob virtutem (for virtus) — and were carved upon their tombstones. Decorations were of enormous importance to soldiers. The creation and elaboration of a permanent rank structure for the imperial army also allowed promotion in that structure to be used systematically as another form of motivation. And no wonder, for not only did promotion bring honor and easier duty, but the pay structure of the Roman army was severely hierarchical — a centurion was paid fifteen times what a common legionary earned. The decision of some soldiers, including a few never promoted to centurion, to lay out in their epitaphs each posting in their entire career shows how powerful a motivator rank was to these soldiers. Still, despite Longinus’ expectation, Titus was not entirely delighted by him and his emulators: The commander issued an order telling them to prove their bravery without running such risks. Given Titus’ own behavior, his soldiers must have chortled; they certainly do not seem to have paid him much attention. Five days after the capture of the first Jerusalem wall the Romans penetrated the second, were thrown back — Titus and the tribune who had accompanied him over the wall at Jotapata shot arrows to cover the retreat — and four days later pushed their way in again. The siege had now reached its climax; two walls had fallen, but the last wall stretched from the Temple Mount itself. After giving the besieged in the city a respite to surrender, Titus set each of his four legions to building great ramps of wood and earth at opposite ends of the last wall. They raised two ramps against the massif of the Antonia Fortress, which rose from the corner of the Temple Mount. 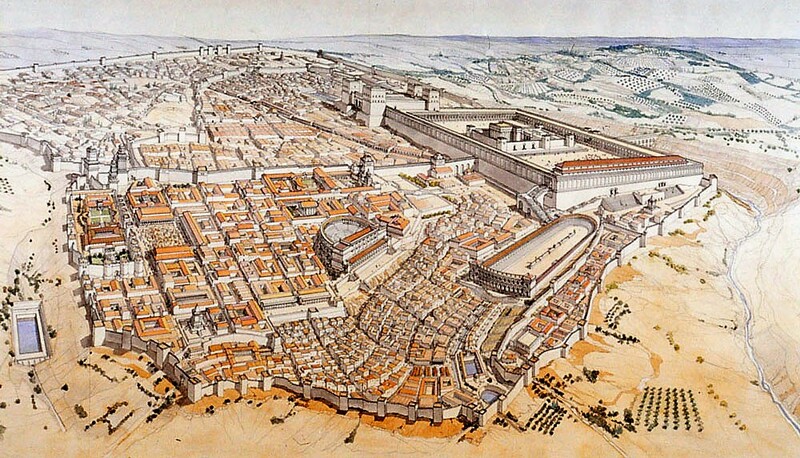 Built as King Herod’s high castle, it had afterward been the sheer aerie of the city’s Roman garrison. As the Temple dominated the city of Jerusalem, so the Antonia Fortress dominated the Temple, and unless the Temple were taken, the city could not be held. 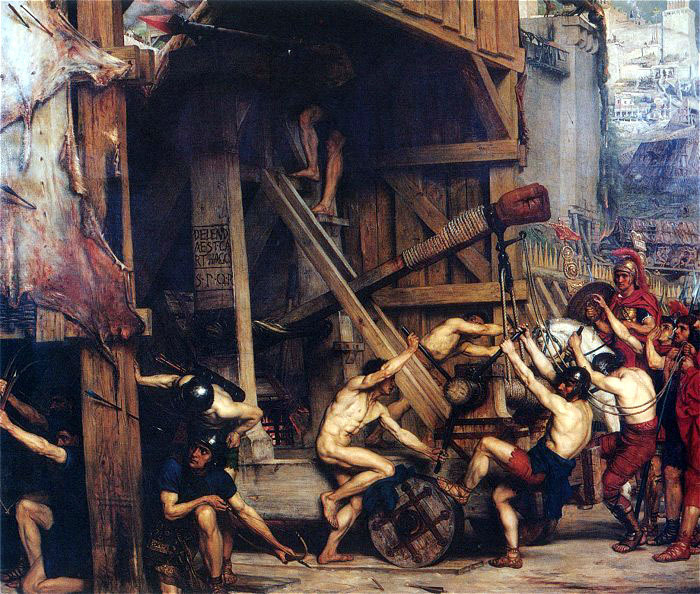 Once again the besieged harassed the builders with raids, missiles, and projectiles from captured Roman engines. For seventeen days the Romans toiled, but underneath them, the defenders tunneled out from the Antonia and propped up the Roman works with timbers. When they set the timbers alight, the ramps collapsed with a tremendous crash. A fierce Jewish sally destroyed the earthworks at the other end of the wall where the Romans had already brought up their rams, and drove the Romans back to their camps, which they defended from the entrenchments. Once again Titus and his guard charged the attackers in the flank, and the Jews were driven back within the walls. But the Roman attack had been resoundingly defeated. The Romans were despondent. Perhaps Jerusalem could not be taken by assault. Perhaps it would have to be starved out. Titus decided to postpone his next attack until a wall had been drawn about Jerusalem. He wanted to stop the smuggling of provisions into the city, so that famine would press even harder upon the defenders. They might even surrender. Building a circuit of entrenchments around the whole of that great city — nearly four and a half miles, with thirteen attached forts — took the Romans only three days, a striking credit to their training. But the achievement reveals something else about the Roman army. Josephus, to whom it seemed the soldiers labored as if possessed, was astonished by the speed of the work, and he reveals how they were motivated. Each section of the circuit was assigned to a legion, each portion of a legionary span to a cohort, each cohort’s share was split between centurions, each centurion’s share split between his subordinates. So at every level soldiers, units, and officers competed with their neighbors under the watchful eye of their superiors, and Titus, the supreme commander, toured the works and was umpire over all. If fighting in the Roman imperial army was competitive, so too was Roman military building. “When I was assigning shares of the work, so that each would know what part of the tunneling was his, I arranged for competition between the soldiers of the fleet and the infantry, and thus they cooperated in drilling through the mountain together,” records a Roman military engineer from the second century a.d. Competition seems to have been the usual method by which the Roman army carried out large projects, like Hadrian’s Wall and the Antonine Wall in Britain. Of Danube’s deep in full arms. to the memory of this stone. emulate my deeds has yet to be seen. Swimming, archery, javelin throwing: This paragon excelled in all. An extended description of auxiliary cavalry drill also survives. Beneath standards and writhing serpent banners, the cavalry competed in riding and charging, wheeling and circling, in casting spears at targets and blunted javelins at one another. Disciplina, existing in counterpoint to virtus, included not merely obedience and punishment but nearly every military excellence that was not encompassed under virtus, including training and building. Roman disciplina was at once something imposed upon the Roman soldiers from above, and something soldiers were expected to feel in their hearts. Like virtus, disciplina was fiercely competitive: It was a source of honor, something on which soldiers prided themselves. When they failed in disciplina, soldiers sometimes felt crippling shame, just as when they failed in virtus. Neither disciplina nor virtus took precedence over the other in the Roman military mind. Under the empire, the opposition of virtus and disciplina developed and flowered exotically into a tacit distinction between the legionaries, among whom the stress was upon disciplina, and the auxiliaries, among whom the stress was upon virtus. It was the exemplars of virtus who were increasingly used in battle, and the exemplars of disciplina who were increasingly used in construction, to erect the sophisticated engineering works that, as the Jerusalem siege demonstrated, gave the Romans a considerable part of their relative superiority in war. This was a matter of emphasis, not a schism; the auxiliaries were not relieved of drill and building, and the army did not cease to recruit and encourage virtus in the legions. But the differing roles of soldiers at Jerusalem and on Trajan’s Column betray a degree of matter-of-fact specialization. After the wall around Jerusalem was complete, Titus ordered four new ramps, larger than the old ones, to be raised against the Antonia; presumably each ramp was assigned to a legion, as the previous ramps had been. In twenty-one days they were complete. The Romans threw back a badly coordinated attack on the ramps by the besieged, and brought up rams against the walls. The defenders cast down stones, missiles, and fire, but the Romans held their positions at the bottom of the walls, the rams did their work, and legionaries even pried out four great stones by hand. In the night, when fighting was suspended, the Roman efforts were rewarded when the wall of the Antonia, undermined by the countermines dug beneath the first ramps and weakened by the rams, collapsed. But behind it loomed another wall, erected in haste by the defenders against just such a development. Now Titus appealed with promises of reward and promotion for volunteers to lead the ascent up the rubble to this new wall. The Roman commander found twelve volunteers, led by a frail, shrunken Syrian auxiliary named Sabinus. The Syrian led on bravely but tripped at the top of the wall. He was overwhelmed, and the assault failed. Two nights later the Romans captured the Antonia in an unexpected way. Twenty legionaries on sentry duty banded together and decided, apparently without informing their officers, to make an attempt upon the wall in the dark. They recruited a standard-bearer of the Fifth Legion (presumably their own), a trumpeter, and two auxiliary cavalrymen for their adventure. The first Titus knew of the assault was when the Roman trumpet sang out from the top of the wall, the attackers having climbed by stealth and killed the sentries. The general called the sleeping Romans to arms and hastened with his bodyguard and staff to reinforce the lodgment. He found the Antonia empty of enemies. The defenders, on hearing the same trumpet blast as he, fled in panic into the neighboring Temple, thinking the Romans were inside the Antonia in force. The fact that there were no forces held in readiness to exploit the ascent of the wall indicates that, like the undermining of the tower at Gamala, the taking of the Antonia was the independent project of common soldiers who drew a more senior man, the standard-bearer, in with them. That so great an event should hang on the private initiative of private soldiers would be surprising in any army. But it is especially so in the Roman army, which had for centuries — in principle — doomed to death sentries who left their posts, a custom upon which Josephus remarks. To attack the wall unordered was to risk death at the hands of both Jews and Romans. Why did the Roman sentries attempt it? The answer lies in the oddest detail of the ascent. Why, on a night so dark as to allow climbing the wall unseen, take a legionary standard? For the soldiers to take a trumpeter up the wall made sense, because they used the trumpet to signal their success from the top. But no one would be able to see the standard of the Fifth Legion atop the Antonia. Yet they carried the awkward object up the wall because, seen or unseen, it symbolized the unit of the soldiers engaged in the perilous ascent. Later in the siege, standards were carried up the Temple wall in the heat of fighting — and lost in a Jewish counterattack. Taking the standard suggests that the soldiers’ brave, punishable, valuable initiative was a product of the ferocious competition between units in the Roman imperial army. It is tempting to associate the rivalry between Roman military units with the bonds of soldierly cohesion so valued and encouraged in contemporary armies. No doubt many years of living and fighting together did produce connections of friendship and mutual loyalty among small groups of Roman soldiers, and no doubt those bonds did contribute, to a degree, to the effectiveness of the Roman army in action. But ancient authors stress far more frequently the fierce rivalry that existed between individual Roman soldiers. Thus the rivalry between units in the Roman army should perhaps be understood as a form of outward-looking solidarity, rather than inward-looking solidarity arising from internal bonds of friendly sentiment. A Roman unit was less like a modern family and more like a modern professional sports team, whose members come together to compete against other teams but whose members’ feelings toward teammates are often more rivalrous than affectionate. 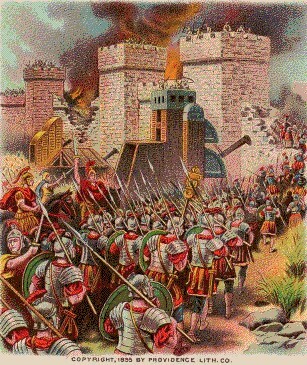 The taking of the Antonia Fortress was the decisive moment in the siege of Jerusalem, for now there was no question that the city would fall. Yet there was much more savage fighting, both for the Temple, which was burned, and for what lay beyond. On the Roman side, the fighting followed the same pattern as earlier in the siege: brave acts by individual centurions and common soldiers, Roman masses advancing without orders and suffering for it, and Titus charging with his cavalry or wanting to fight but being restrained by his staff. As final victory came closer, the Roman soldiers became increasingly uncontrollable. When Titus finally gave them permission to sack and burn the city, he was merely giving his official imprimatur to what was going to happen anyway. When, after the destruction of the city, Titus paraded his army, decorating and promoting and rewarding with booty those who had distinguished themselves and thanking his soldiers in general for their courage and obedience, we may suspect more than a slight note of irony at the latter. When the last resistance in the city failed, the Romans slaughtered until their arms grew weary: Now devouring fire and quenching blood fought their own battle for control of the streets. The total Josephus gives for the dead in the siege — 1.1 million, or nearly half the Jews in Judea — may be somewhat less unlikely than most such stratospheric figures that survive from antiquity. 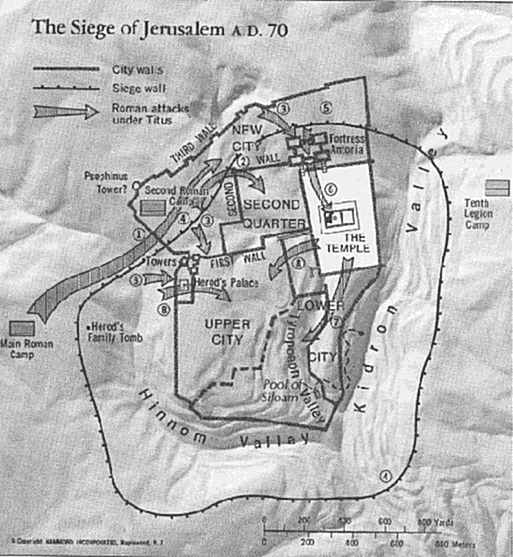 The siege of Jerusalem was probably the greatest single slaughter in ancient history. Not only was the city sacked and burned, but Titus gave directions that what remained should be wholly demolished, except for a stretch of wall and some high towers that were left as a symbol to the world of Roman strength — and as a warning to anyone who might again defy the fury of the Romans. Titus returned to Rome soon after the capture of Jerusalem, leaving the final mopping-up operations in Judea to his successors. The final drama played out at the fortress of Masada, perched on a gaunt fourteen-hundred-foot prominence and besieged by the Tenth Legion and several thousand auxiliaries. In a massive engineering feat, the Romans built an enormous ramp to the walls of the fortress and winched up their siege engines. The end came in April of a.d. 73, when more than nine hundred of Masada’s defenders — all but two women and five children — chose suicide over inevitable defeat. Bedazzled by the contrasts between the Romans, the chaotic Galileans he commanded, and the Judeans whose fighting and infighting he witnessed during the Jewish war, Josephus pointed to discipline and training as the key qualities that set the Roman army apart. Josephus’ own narrative, however, shows that his formulation was far too simple. Roman soldiers of the empire remained highly volatile, not only subject to panic (like all armies, in all generations) but also to disobedience born of individual and mass aggression. Roman generals understood that Roman victory depended on maintaining a balance between competitive disciplina and undisciplined virtus. Generals could preach and rail against the heedless boldness of their troops, but they did not execute them for it, knowing full well that the success of their soldiers in battle depended on the qualities of spirit that produced their disobedience and being happy to profit from the initiative that spirit produced, as when soldiers without orders undermined the tower at Gamala or made their night ascent up the Antonia. The Romans saw no contradiction between their training and discipline on the one hand and recruiting and using in battle men not brought up in Roman ways on the other. They did not worry (as many modern commentators have) about the increasing use of barbarian soldiers in the Roman army. To the contrary, the army actively sought out wild soldiers, confident that disciplina was easier to teach than virtus, which came in the blood or had to be inculcated from birth and could only be evoked, not created, by leadership. A professional army with long terms of service needed to recruit wilder soldiers to preserve the balance of disciplina and virtus upon which victory depended. The Romans in fact exploited the variations in degree of virtus and disciplina that their recruiting and training produced, the legions coming to be valued and used especially for their competitive disciplina, the auxiliaries for their competitive virtus. The vaunted discipline of the Romans drew its strength from the ancient Roman culture of competition, and even so, the Romans knew full well it was of little use alone. Roman victory came from mixing civilized competition in duty, training, and restraint with savage courage, from joining the dark forest to the shining city. This article was written by J.E. Lendon and originally published in the Summer 2005 edition of MHQ. J.E. Lendon is an associate professor of history at the University of Virginia. This article is excerpted from his book Soldiers and Ghosts: A History of Battle in Classical Antiquity, to be published in May 2005 by Yale University Press. Copyright ©2005 by Yale University.